Steve Withers gets to grips with Marantz’s multi talented, multi channel AV processor. 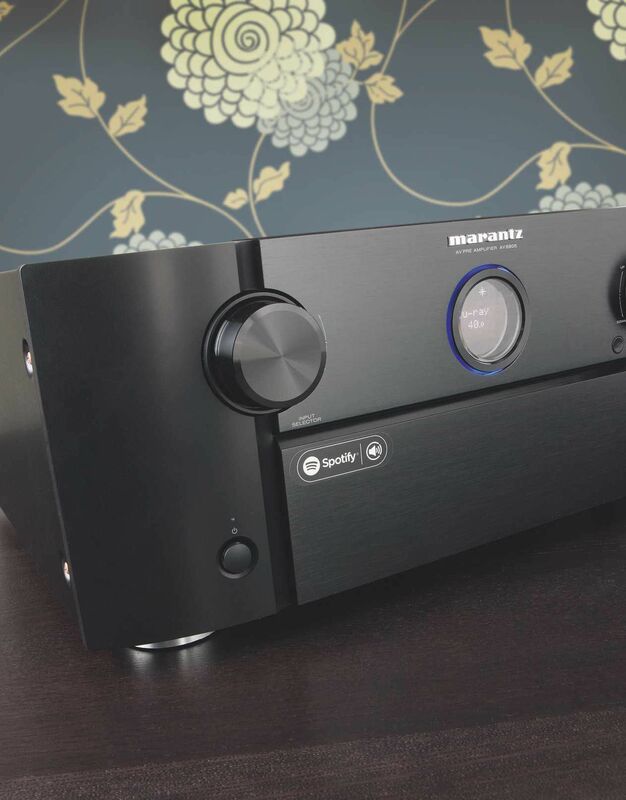 Read our MARANTZ AV8805 Review. 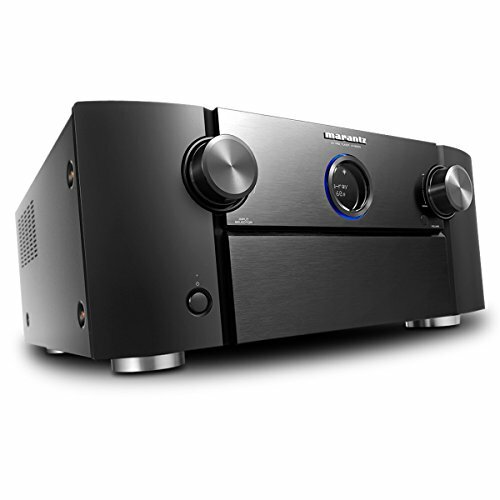 The AV8805 is Marantz’s new flagship AV processor, capable of decoding a whopping 13.2 channels. In fact it’s a technological statement of intent, an AV processor that boasts just about every feature imaginable. So not only does it support Dolby Atmos and DTS:X, it also handles Auro-3D – making it the only preamplifier to decode all three immersive audio formats at anything approaching a sensible price. 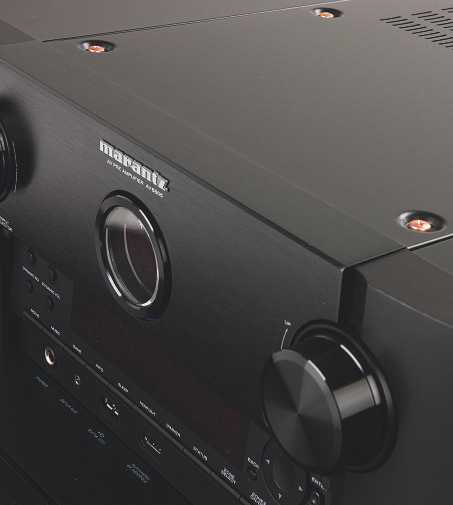 Marantz puts the audiophile into home cinema with a state-of-the-art 13.2-channel preamplifier that's both capable and great value. Some will own the previous AV8802A and are wondering if they should upgrade. What else is new here beyond the expansion to 13.2 channels? HEOS multi room, Amazon Alexa voice command support, and eARC ability. 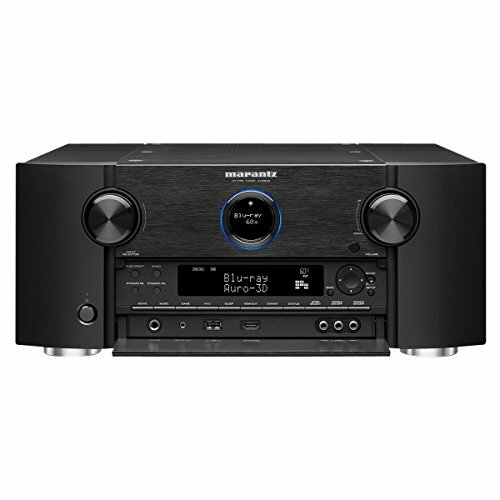 Although, if you like having a built-in AM/FM tuner, you might want to keep your AV8802A because Marantz has dropped it from the AV8805. The processor is classic Marantz, with a clean minimalist design and almost no controls actually visible. There’s just an input selector, a volume dial and a cool-looking circular display surrounded by a blue light (which you can turn off). The fascia is hewn from a solid piece of aluminium, which makes it fairly imposing, but the two-tone finish softens the appearance. I prefer my AV kit understated rather than bling-ed up in a champagne silver-gold finish. 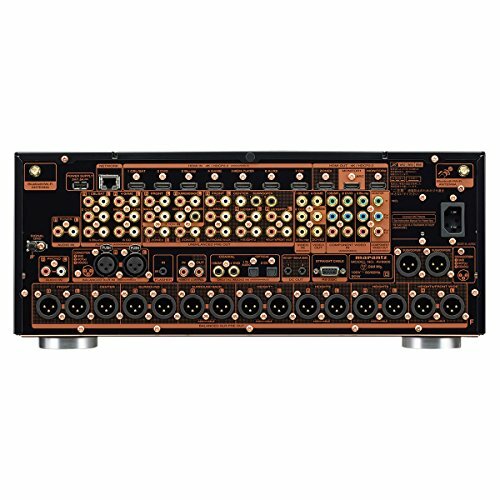 The rear of the AV8805 is a daunting sight, with a bewildering number of inputs and outputs. There’s actually a total of seventeen (yes, you read that right) outputs using a choice of either phono or balanced XLR. I should stress that the Marantz can only decode a total of thirteen channels at any one time, but the additional outputs allow for different speaker configurations. So assuming you have the room, the speakers and the inclination, you could wire up nine ear-level channels with five height channels and two subwoofers, and run separate configurations for Atmos/ DTS:X and Auro-3D, switching between the two. The AV8805 boasts a total of eight HDMI inputs and three HDMI outputs, the latter allowing you to run two displays in your main room and a third in another. One of the outputs supports ARC, with the aforementioned eARC on the way via firmware to allow object-based audio from your TV. All HDMI inputs and outputs are version 2.0b, which means the Marantz can pass HDCP 2.2, BT.2020, and HDR10, Hybrid Log-Gamma (HLG) and Dolby Vision, so there’s a solid level of future-proofing. 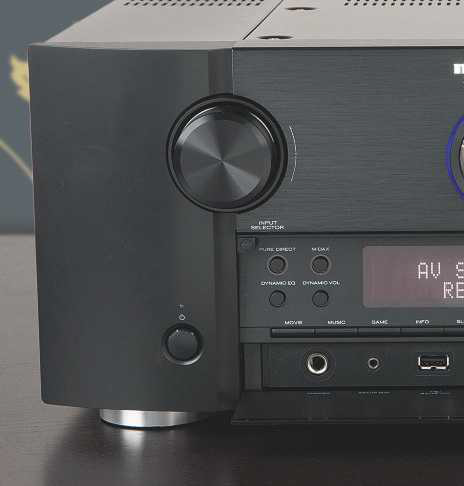 Additionally, there are two component video inputs and an output, and the more retro amongst you will welcome the multitude of stereo analogue inputs and phono stage. There’s also a 7.1-channel input for anyone still rocking an older multichannel source, and a balanced XLR input. There are only four digital inputs (two optical and two coaxial), and no USB-B, which is disappointing given the otherwise comprehensive nature of the connections. On the multimedia side, there’s built-in Wi-Fi and Bluetooth, plus an Ethernet port for a wired connection. There’s support for Apple’s AirPlay and Spotify Connect, along with HEOS multi room, so you can listen to sources connected to the preamplifier in other rooms and vice versa. It’s highly effective and all controlled from a well-designed app. Another app offers control of the Marantz. You can stream DSD (2.8/5.6MHz), FLAC, ALAC and WAV, as well as lossy formats like MP3. The processor also supports TuneIn internet radio, Sound Cloud, Tidal, Napster and Deezer, making it a very capable device for music. In fact, thanks to Marantz’s heritage, it’s one of the most musical AV processors that I’ve ever heard. Video passthrough encompasses 4K at 50Hz/60Hz with full 4:4:4 sub-sampling, and the AV8805 upscales 1080p content to 4K. Imaging Science Foundation certification means there are calibration controls but I’d recommend tweaking the picture at the display end, and setting the Marantz to passthrough. Despite its apparent complexity, the AV8805 is easy to set up, while offering a dizzying array of speaker configs; for Atmos, for instance, you have the option of a 9.1.4 or 7.1.6 implementation. Audyssey MultEQ XT32 room equalisation is reasonably effective but lacks the sophistication of Dirac Live, which is used by Arcam and Emotiva, or Trinnov’s insanely capable bespoke EQ. I’d recommend assigning levels manually and then setting the individual crossovers for each speaker. During testing I ran a 7.2.4 system using a Trinnov Amplitude 8M and Arcam P429 power amplifier. The AV8805 can upscale soundtracks to 7.2.4, so I started with the 4K Blu-ray of Dunkirk, which is my go-to 5.1 disc these days. The Marantz delivered the action scenes with wonderful aggression, taking full advantage of the headroom in the amplification to deliver a dynamic experience. It made use of the available channels, opening up the overall soundstage in a way that felt totally organic. There’s a terrifying precision to the scream of the Stuka dive bombers, and the subsequent explosions add plenty of well-integrated bass impact. There was also a subtlety to the processing, with the sounds of wind and surf on the beaches rendered with a pleasing sense of realism. I’ve never heard a Stuka or an explosion in real life (thankfully) but I know what a beach sounds like, and the Marantz delivered it perfectly. This unit can effectively upscale soundtracks regardless of which processing you choose, although I tend to favour Dolby Surround. It was especially effective during the Spitfire cockpit sequences, with sounds emanating from all the speakers as the airplane rattled through every g-force- inducing turn. It was so immersive that it sounded like an Atmos mix, even though I knew it wasn’t. I then moved on to an actual Atmos track. Gravity (Blu-ray) is another of my favourites, with its highly directional object-based mix that’s a perfect test for effects steering and tonal balance. Dialogue often moves around the room in a 360-degree soundfield, and the AV8805 did a wonderful job of moving the voices and effects from speaker to speaker. Mine are all B&W at ear-level but I’m using JBLs on the ceiling, so the Marantz impressed in its ability to keep every channel tonally matched. The processor was also effective at creating a three dimensional soundstage around my seating position, not only in terms of the voices and effects in Gravity but also during the scenes in space. Since sound can’t carry in a vacuum, a lot of these effects are designed to replicate the way audio would be inducted through the body. This means the sounds are almost felt rather than heard, and the AV8805’s ability to subtly use the subs during these sequences was key. Of course we don’t always want our bass to be subtle, so next up was Blade Runner 2049 (Ultra HD BD) with its titanic, foundation-shaking Atmos soundtrack. Right from the start this mix puts a staggering amount of low- frequency energy into the room, and despite my best efforts, there are still a couple of rattles I haven’t been able to fix with a lump of Blu Tack. The AV8805 effectively marshalled my two Sunfire subs at the front of the room, creating a bass performance that was smooth and even, yet powerful. It also underscored the rest of the mix, adding impact but never smothering everything else, which is exactly what bass should do. Once again, the precision in terms of effects localisation and steering was impressive, with spinners flying overhead and the height channels being used to conjure a crushing sense of claustrophobia when the action moves to street level. The immersive nature of the soundtrack is best demonstrated during the scene where the transport is filling up with water; you’ll find yourself holding your breath along with Harrison Ford as he impotently watches his younger co-stars kick seven bells out of each other. My current favourite DTS:X mix is from the Jurassic World Ultra HD Blu-ray [see page 94]. This has everything from the terrifying roars of the dinosaurs – that use almost every frequency imaginable – to the subtler employment of effects to deliver the experience of being in the jungle. There are plenty of scenes that take place outdoors and the Marantz is able to create a huge soundstage with enough depth, width and height to contain the film’s paleontological stars. The AV8805 can be both nuanced and aggressive, as demonstrated during the Asset Containment Team’s unsuccessful attempt to actually contain the asset. There’s a quiet moment as they discover the dinosaur’s missing tracker, and you can hear it beeping, while the ambience of the jungle cocoons you. Then you hear a faint movement in the trees above, followed by a guttural growl that is given massive visceral weight by the subs. The team is in big trouble and when the Indominus Rex attacks, all hell breaks loose. There’s gunfire, explosions and deafening roars, and impressive use of dynamic range. However, within this sonic cacophony, specific effects are deliberately given more weight as a narrative device, and despite the busy nature of the mix the Marantz ensures these are delivered with precision. It’s a great in-a-nutshell sequence that proves this processor’s poise and power. 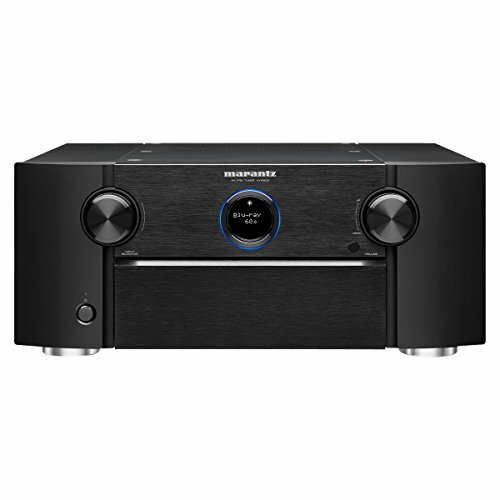 As updates go, the Marantz AV8805 makes sense. The AV8802A was never under-endowed, but this aims higher (literally) with its additional channels and HEOS integration. It’s a superb preamplifier, combining audiophile components with state-of-the-art multichannel processing. It sounds incredible with movies, and is equally adept with music, making it the ideal choice for someone who wants a system that can handle both with aplomb. 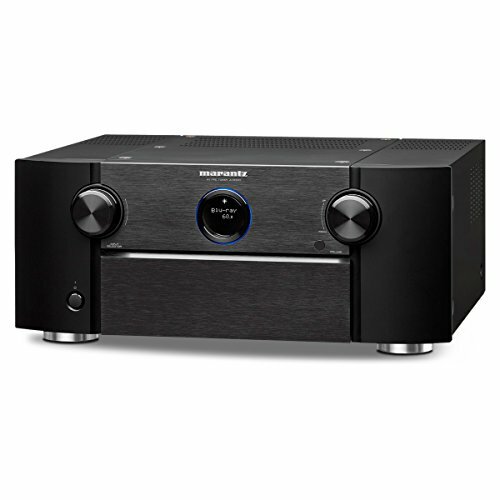 Marantz has yet to deliver a 13-channel power amp, but this seven-channel model is an aesthetic match for the AV8805. Rated at 150W per channel, use it for your base-layer speakers and add additional amps for height.